The Inglesina Balestrino Frame is a classic style chassis made to attach easily to the Inglesina Classic Bassinet Body or Classic Stroller Seat and Hood. This Classic Carriage system is the epitome of quality, style and fashion. Named because of its old-time classic style, this premium pram is hand made in Italy using fine European materials according to the 35-year old standards of Inglesina. 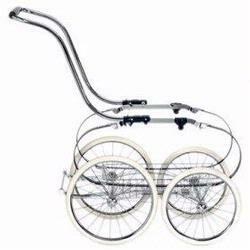 The Balestrino frame has 14 and 16 buggy style white tires with maximum suspension - perfect for strolls on urban streets or parks. The rear brakes are activated by a touch of your foot. A unique safety system prevents tipping or accidental closing. Let your baby ride in luxury in this classic carriage.